Tweet counts and analysis for Friday, July 9th. Friday Morning Update: In what was quite a reversal, Predators put the sword to Despicable Me on Thursday as it vaulted ahead for the first time in the week. Despicable Me actually dropped 15% on Thursday to 5,387 tweets and a market share of 5.5%. 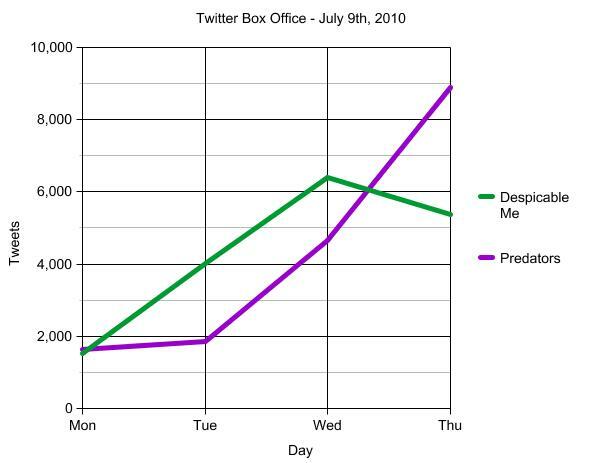 Tuesday and Wednesday figures for the film had a large amount of additional buzz thanks to the retweets and meme from the last trailer (as I spoke about here), so the drop yesterday was likely it falling back towards its otherwise normal buzz levels. Regardless, 5,000+ tweets for kiddy targeted film is still very impressive. The fact that Universal was quite actively trying to raise awareness on Twitter is alone a big boost in its numbers, but even excluding that its numbers have been exceptional. The film has connected with many young users of Twitter and its clips and trailers have really made the rounds and generated a lot of buzz when compared to many other recent animated films. Even in giving it the same ratio as Toy Story 3 would put it north of $10 million for Friday, and the circus around the film hasn't been on the same level. My prediction remains unchanged from yesterday, look for a ratio of ~1,300 and $13 million for it on Friday on its way to $36 million for the weekend. Predators had the final laugh on Thursday as it pounded Despicable into second place on the day with 8,881 tweets and 9.0% market share. This was a steep rise from Wednesday's 4,657 tweets and 4.4& market share. Couple points of note here: the movie also opened in a ton of countries on Thursday, a fact which no doubt boosted its totals. The most notable of which is the UK which is the most tweet-happy English speaking location outside of North America. Also, franchise scary flicks such as this tend to have strong midnight showings, and standing in line for a film and tweeting seems to go hand in hand nowadays. Its surge on Thursday has actually left it ahead of Nightmare On Elm Street but I do believe its ratio will come out being a lot higher thanks to the above mentioned facts and that with a much higher profile cast more attention is being drawn to the film from many avenues. With these factors in mind its ratio should hit very close to the 2,000 mark for a $9 million Friday and a $23 million weekend. No its not a typo, The Sorcerer's Apprentice is yet to crack the top ten even thoguh it is just a week from release. It was sitting at #12 with 510 tweets yesterday. It has been struggling big time despite a very simple name to track down tweets. The buzz just isn't there. Check back on Saturday for the final ratio and Friday numbers and again on Sunday for a preview of the following week's openers. Follow @AlexBOXOFFICE on Twitter for additional updates. Please check the methodology page for information about the project and historic data.